Roanoke was established in 1587 by a group of 115 English settlers. The colony was located on the outer banks of what is today Dare County, North Carolina. The exhibition was lead by England native John White in hopes of building a naval port for English ships to use against Spain’s fleet, at war at this time with Britain. It was the first settlement to include families in New World and was also the first settlement to produce the first child born from English parents. John White left the colonists during ongoing disputes with the Natives to gain more supplies for the settlers but didn’t return to Roanoke until three years later. After his return, White discovered all of the colonists to be vanished with all remaining being two cryptic codes on nearby trees, “Croatoan” and “CRO”. It was originally believed that the colonists were hinting at their migration to Hatteras Island 50 miles away however this theory could never be fully proven correct. 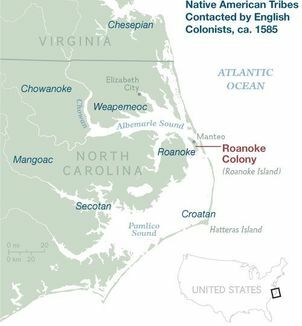 Roanoke, one of the first attempts of a New World colony, has a new theory behind its disappearance based on a recent finding on a map that outlines the colony’s surrounding area. The British Museum recently re-examined Governor John White’s watercolor map of Roanoke, using 21st century imagining techniques such as X-Ray imagining and infrared light. Researchers found a hidden drawing that was covered underneath a patch which was originally dismissed by researchers as a correction. The patch uncovered a four pointed blue and red star drawn on the western Albemarle Sound. Researchers believe this star was possibly created using a type of invisible ink. 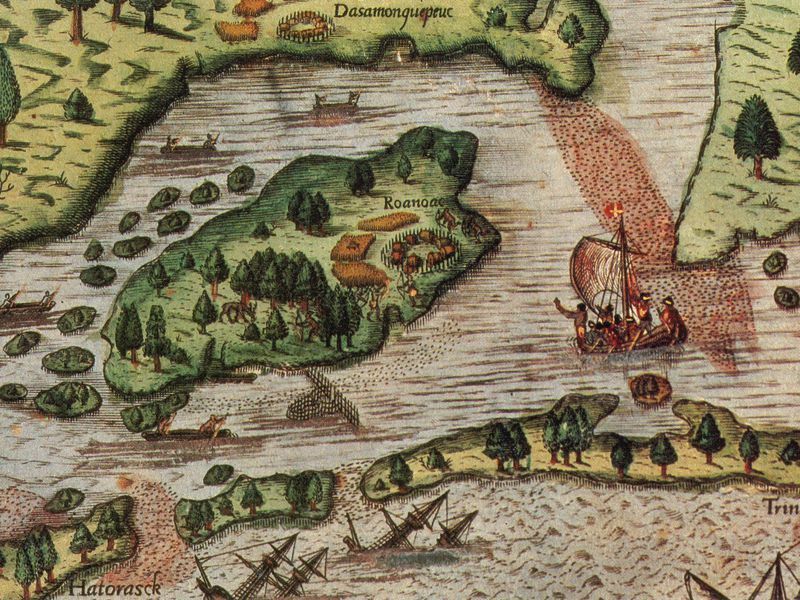 The star’s location was close to a Native American village and was on a protected-harbor which supports the idea that his location could be pinpointing a military fort for the new settlers. Researchers now hypothesize that the star was deliberately hidden by White. Lines underneath the patch could indicate to the use of lemon juice or milk which activated by a heat source, allows invisible ink to reveal its secrets. Although this is not a a proven conclusion to the markings on the map, it is a possibility to explain why White used a patch to cover up area. What truly happened to the colonists of Roanoke remains to be a mystery. Numerous digs have been conducted by organizations with hopes to reveal the site of the lost colonists, only to reveal small pieces of pottery or other artifacts which is not enough to account for an entire village going missing. Many theories, such as the colonists assimilating into the local Native American tribe named Croatoan, which would hint to the mysterious markings on the tree White found. 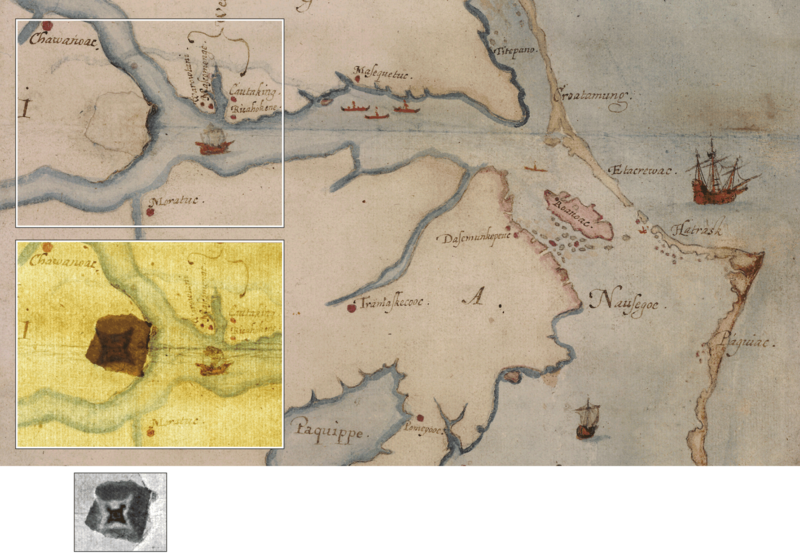 The newly discovered markings on White’s map adds another theory to the location of the lost colonists which excites researchers in the cartography and colonial history field. The colonists’ location however remains a mystery in today’s world but research will continue in an attempt to solve the mystery of of American’s missing colonists. « Map of the Week: What’s in an Irish Surname?